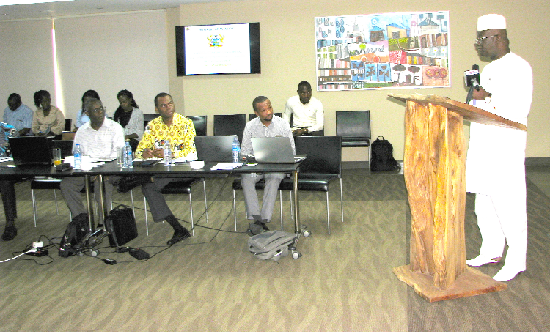 Mr Joseph Kofi Adda(standing),Minister for Aviation addressing participants present. The government is hopeful that it will complete the necessary documentary procedures in order to make the proposed national carrier operational in the second quarter of 2019. It is, however, putting in place the necessary impetus to support access to aircraft, route rights and airport slots at destination airports to ensure that the new born airline is founded on a solid bases to become sustainable. The Minister of Aviation, Mr Joseph Kofi Adda, who disclosed this to the media on January 9 at a strategic meeting by the Ministry of Aviation at Peduasi in the Eastern Region, observed that by March this year, the government was hopeful to complete all the procedures to ensure the airline start operations in the second quarter. “We have gone far with processes to ensure that the national carrier become operational. We have entered into an understanding with Ethiopia Airlines and have been engaging other investors who have shown interest in the project,” he said. On the ownership structure, he stated that the government was working to give preference to Ghanaian investors in order for them to own more shares. The minister emphasized that the government had settled on Ethiopian Airlines (ET) to help it revive the country's dream of getting a national carrier. As the majority shareholder, he said ET would also contribute managerial services to ensure effective running of the new carrier which is initially expected to fly within the Africa routes before subsequently moving to the global market. He stated that the ET would manage the yet-to-be established carrier until the country had built the needed capacity to takeover. The desire to establish a new home-based carrier after the collapse of Ghana Airways, a fully state owned entity and the subsequent collapse of Ghana International Airlines, established with private sector participation after the collapse of Ghana Airways, stems from growth in the sector experienced on the continent and the industry’s future potential. According to the Africa Outlook report for 2018, aviation in Africa currently supports US$72.5billion in economic activity and 6.8 million jobs, but Africa’s proportion of the global tourism industry is receding – as the continent’s share shrunk from 4.8 per cent of global arrivals and receipts in 2006 to 3.3 per cent in 2016. Africa’s potential ,however, remains huge, given the increased investment in on-ground infrastructure and substantial growth of the middle-class on the continent. In a related development, the minister directed that the Terminal Three of the Kotoka International Airport (KIA) be modernised to make it Ghanaian and more convenient for passengers and travelers to use. In its current form, the minister said the new facility was too foreign and lacked indigenous touches that would make it Ghanaian. “The terminal is a beautiful facility that we all admire but it has a number of shortcomings which need to be addressed to meet global standards," he said. "When you fly to Ghana and you look at the facility from the airside you do not see anything Ghanaian about it. Yes, there are some designs but there is nothing like Adinkra symbol, Ghanaian culture or the national colours. "Anybody that has not been to Ghana before should land at the airport and say this is Ghana but in its present state, the facility does not look Ghanaian," he said.